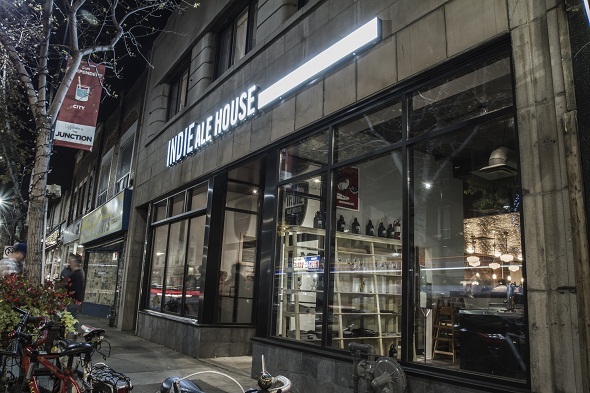 Indie Alehouse is the much-anticipated brewpub that has finally opened on Dundas Street in the once-dry Junction . With an opening date that was long-delayed by red tape, construction woes, and unexpected surprises, anticipation about Indie Alehouse among Junction residents, the city's foodies, and beer fans alike has been mounting. 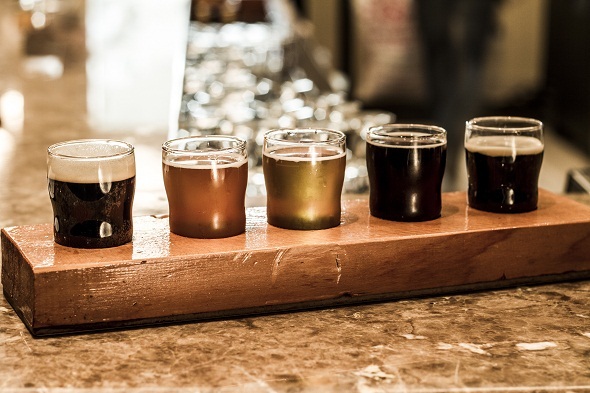 But as I found out on a recent visit, the neighbourhood's long-awaited first brewpub actually manages to meet all those expectations and provides a dining experience that's likely to please almost everyone. The space, once occupied by Reitmans, has been extensively renovated, including a new facade and some more technical work to ensure that the heavy on-site brewing equipment rests firmly on the old building's basement I-beams. 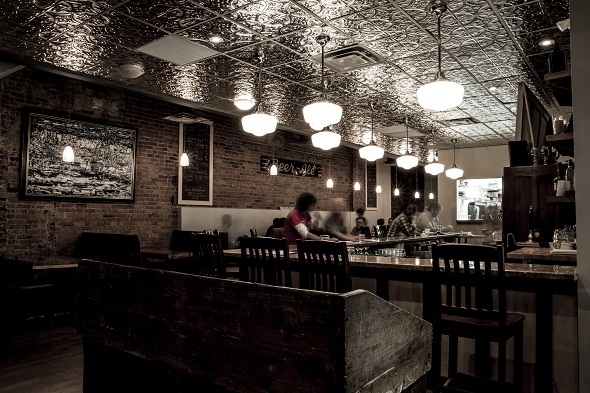 The decor and vibe are well-suited to the food and beer menus in that everything here suggests upscale pub. Subdued furniture in wood with exposed brick walls are accented by slightly more elegant touches like a slick marble bar and a punched-tin ceiling, with a handful of interesting pieces acquired from local reclaimed furniture stores Smash and Forever Interiors . It's the kind of unpretentiously rustic place that will appeal equally to the scene-oriented set and Junction locals looking to have an after-work pint — of which both demographics were clearly represented on the Wednesday evening I visited. To start the evening I had a pint of one of Indie Alehouse Brewing Company's staple beers, their Instigator IPA. It was a great coppery-coloured pint with good head and mild citrus aromas. There's a pleasant hop bite with a subtle malty backbone and a classic American pale ale bitter finish. I was immediately impressed and anxious to try Indie's other brews, which include a phenomenal Breakfast Porter ($6 for 16oz), their Red Tape Stout — named in honour of the difficulties getting the place up and running — ($5.50 for 9oz), and their Pumpkin Abbey, a beer that will change the way you think about pumpkin beers ($5.50 for 9oz). 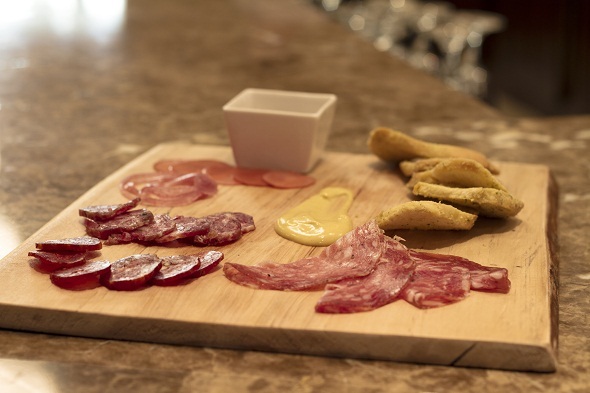 Once my guest/photographer arrived, we ordered Indie's Chacuterie Platter ($19), a rotating selection of meats that head chef Patrick Fraser, formerly of Salt , has had brought in from Dolce Lucano in Woodbridge. Tonight it's wild boar sausage, spicy fennel cacciatora, and cured beef served with some pickled onions, radish, and grapes. All the meat was excellent, though it was arguably a little small for two people to share — especially two hungry people currently drinking great pints of beer. 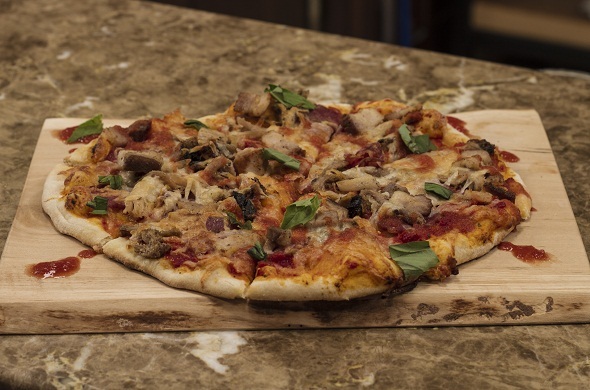 For dinner, we order the Smoked Pulled Pork Sandwich ($13) and the Three Little Pigs Pizza ($15), which includes smoked pork, more wild boar sausage, and Berkshire pork belly. 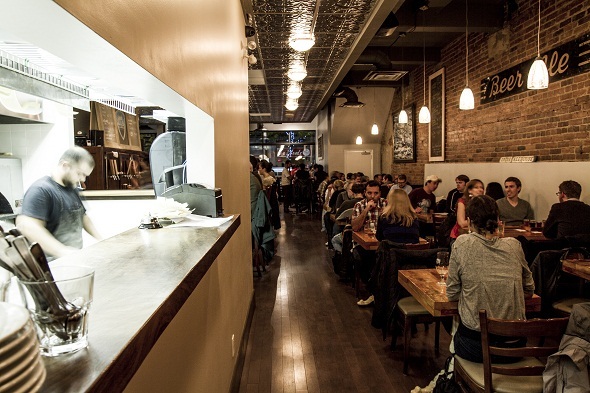 Two meals, it turns out, that are pretty solid choices and representative of the food Indie Alehouse does best given that the kitchen includes a pizza oven and an in-house smoker. The Three Little Pigs Pizza was great and, to borrow from the wrong children's story, was just right. No topping overwhelmed any of the others — there was no over-abundance of sauce or cheese and, remarkably, despite three iterations of pig on the dish, it wasn't too salty or heavy. The pulled pork was likewise satisfying. The meat was cooked to a point where it was perfectly soft, but just short of dry, and was smothered with just the right amount of Carolina BBQ sauce. The sandwich came with fries and house cole slaw. Aside from the pizza offerings, the other menu items echo the upscale pub vibe with snacky yet interesting options like Parmesan and Sage Popcorn served with whipped bacon fat butter ($3), Chilli and Cheese Fries ($9), and even Mac and Cheese — albeit mac and cheese with portobello, oyster, and honey mushrooms ($11). By about 7:30pm, the place was starting to get full, despite the fact that there's still been no official opening yet, aside from "a few tweets." Owner Jason Fisher says a lot of their business thus far is thanks to enthusiastic locals. "They seem pretty happy we're here and they've been extremely helpful. I wouldn't be here without the support of the Junction." And while some people seem to wander in not quite knowing what they're getting into — I overheard a customer try to order a Fosters — it seems pretty clear that they're all won over by the time they leave; a fact made all the more clear by the line that was forming at Indie's small retail space, which currently sells 1.9 litre growlers of their staple beers. Clearly, the Junction is happy that the Indie Alehouse has finally arrived, and it won't be long before the rest of the city gets on board too. 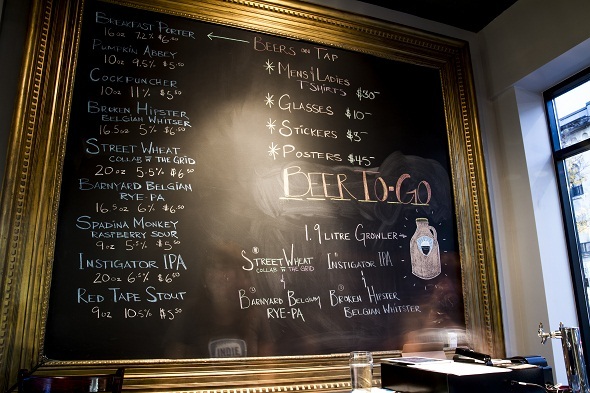 For more on Indie Alehouse's beers, check out Ben's Beer Blog. Photos by Paul Aihoshi .